Hyaluronic acid is a naturally-occurring substance in skin known for its stunning capacity to attract and hold onto 1000x its weight in moisture. It works overtime by replenishing skin to enhance a healthy, supple look and feel. In the world of skin care, trendy ingredients come and go (and many of them never should have been popular to begin with!). Research shows that hyaluronic acid is not just a trend; on the contrary, it’s one of the best skin care ingredients you can use. Hyaluronic acid is a glycosaminoglycan, a fancy name for a vital naturally-occurring substance that’s part of skin’s youth-supporting matrix. As the chief glycosaminoglycan in skin, hyaluronic acid works to keep every aspect of skin stable, safeguarded, and constantly renewed. Hyaluronic acid is also a humectant, which is a category of skin care ingredients that are hygroscopic, meaning they draw moisture from their surroundings. Humectants are often found in water-based moisturizers, serums, and other leave-on skin care products because of their ability to help boost hydration for all skin types, which is especially beneficial for dry, dehydrated skin. How Does Hyaluronic Acid Help Dry, Dehydrated Skin? So, what does hyaluronic acid do? The science-based magic lies in hyaluronic acid’s ability to replenish a LOT of moisture. One gram (or 0.03 oz.) of hyaluronic acid can hold up to six LITERS of water. Talk about mind-blowing! What’s even more impressive is that hyaluronic acid can do this for skin without tipping the scales and giving skin too much water (which, surprisingly, can be a problem because it breaks down key substances that normally hold skin’s surface intact). Hyaluronic acid can enhance moisture content beyond comparison. It also revitalizes skin’s outer surface layers, so they look and feel softer, smoother and radiantly hydrated. This instantly improves the appearance of fine lines and wrinkles. Our highest concentration of hyaluronic acid to visibly plump skin and fine lines. Ultra-rich cream that revives skin’s barrier while addressing advanced signs of aging. Weightless hydration specially formulated for blemish-prone skin. Strengthen skin’s defenses while softening overnight. Hyaluronic acid’s moisture-binding characteristic is exceptionally important when it comes to skin aging. When we’re young, our skin can hold onto water and retain a balanced amount of moisture, but it loses this ability as we age. The result is a visible loss of firmness, pliability, and a diminished appearance of plumpness and suppleness (hello, wrinkles). Simply put, hyaluronic acid has powerful anti-aging properties. Unprotected sun exposure and environmental assault weaken skin’s surface and cause premature aging. Hopefully you already know that daily use of a broad-spectrum sunscreen and avoiding harsh skin care ingredients is a must for combating these things, but you might not know that hyaluronic acid’s antioxidant and skin-replenishing properties go a long way toward mitigating those issues, too (especially when used as part of a complete anti-aging skin care routine that also includes other research-backed ingredients). Now that’s what we call a multitasking anti-aging ingredient! In addition to hyaluronic acid, you may have seen the similarly named sodium hyaluronate on a skin care product’s ingredient list. Not surprisingly, these two ingredients are related: sodium hyaluronate is a salt that’s derived from hyaluronic acid. Sodium hyaluronate is helpful in the same way that hyaluronic acid for skin is, but with one extra advantage— skin absorbs it more easily than it does hyaluronic acid. Does that mean that sodium hyaluronate is better than hyaluronic acid? No! In fact, the Paula’s Choice philosophy is that it’s great if products such as hyaluronic acid moisturizers and creams contain both forms of the ingredient, so your skin can reap the benefits on multiple levels. There are some products on the market that contain both ingredients, but because hyaluronic acid is more expensive, sodium hyaluronate shows up more often in skin care products. Note: Some companies use what’s called “low molecular weight” hyaluronic acid, which has a smaller molecule than regular hyaluronic acid. Molecules of “regular” hyaluronic acid are larger, which explains why they remain on skin’s surface. Making hyaluronic acid smaller means it can reach a bit farther into skin’s uppermost layers for visibly enhanced results. Now that you know how hyaluronic acid and sodium hyaluronate can benefit skin, you might be wondering how we’ve chosen to incorporate these research-backed ingredients into our products. 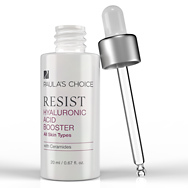 Paula’s Choice Skincare often includes both forms of these hero humectants in moisturizer, serum, toner, and face mask formulations, so you have a variety of ways to add hyaluronic acid to your skin care routine. Hyaluronic acid is incredibly gentle and phenomenally helpful for all skin types, even the most sensitive, redness-prone skin. In fact, its positive influence on skin’s surface is due in part to its natural calming benefit, which means it is also suitable for breakout-prone skin. Each of the following fragrance-free formulas contain redness-reducing, hydrating, and antioxidant ingredients that make skin smooth and soft, and they’re gentle enough even for those with eczema-prone and rosacea-prone skin. With a silky, lightweight texture that’s perfect for all skin types, our Hyaluronic Acid Booster is indispensable for its hydrating, line-smoothing formula, supported by ceramides to reinforce skin’s natural barrier. Apply directly to skin after cleansing, toning, and exfoliating, or mix into your favorite serum or moisturizer. Those with dry to very dry skin will find our RESIST Intensive Repair Cream’s rich, retinol-spiked formula is ideal for a daily (and/or nightly) dose of wrinkle-softening hydration from sodium hyaluronate, ceramides, and peptides. If achieving radiant, glowing skin overnight is one of your skin care goals, you’ll appreciate our RADIANCE Renewal Mask’s lush gel texture and innovative formula of skin-plumping sodium hyaluronate plus brightening antioxidants niacinamide and vitamin c, and well-researched hydrating ingredients. If you struggle with blemishes and are on the hunt for the best moisturizer for acne-prone skin, look no further than our CLEAR Oil-Free Moisturizer. Its sheer lotion texture features sodium hyaluronate, ceramides, and blueberry extract to provide hydration and soothe redness. Our DEFENSE Nightly Reconditioning Moisturizer prevents premature aging with a refreshing, all-skin-types formula loaded with antioxidants, superfoods, and sodium hyaluronate that strengthens skin's defenses overnight. Pair any of the above with our RESIST Brightening Essence which uses natural plant-based extracts to banish dull skin and improve uneven skin tone while supplying skin with hyaluronic acid’s many benefits.